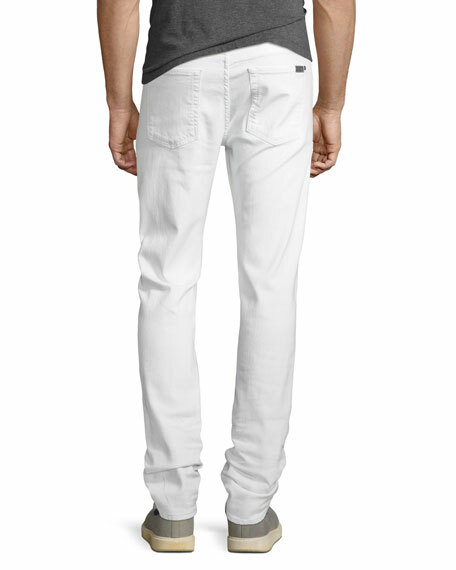 7 For All Mankind "Slimmy" jeans with ripped and repaired details. 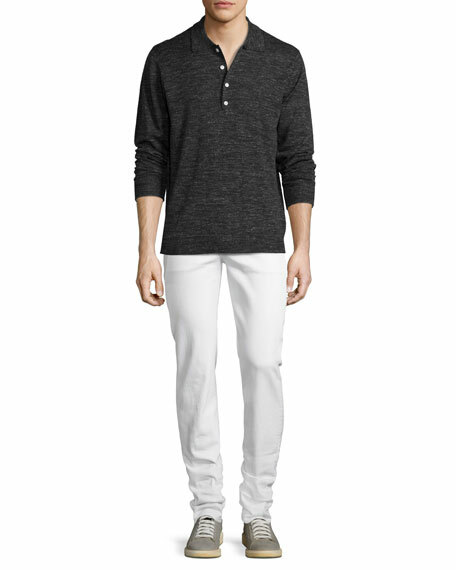 Slim fit through slightly tapered leg. AG Adriano Goldschmied "Graduate" jeans in denim with sueded texture. Five-pocket style with tonal stitching. Relaxed rise. Slim-fit; straight legs. AG Adriano Goldschmied "Graduate" jeans in denim with sueded texture. Five-pocket style with tonal stitching. Relaxed rise. Slim-fit; straight legs. Button/zip fly; belt loops. Cotton/polyurethane. Imported of Italian material. Model's measurements: Height 6'1"/185cm, waist 32"/81cm, typically wears size M.